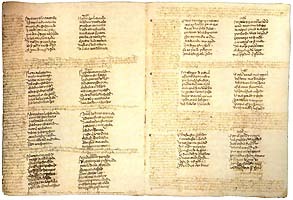 1.- Around 1350, an important change in Spanish lyric was observed. The authors´ language changed from being Galician-Portuguese -which even Alfonso X the Wise used in his poems- to Castilian. The verses began to be defined in different forms, using as their basis, eight syllables -octosyllable- and twelve (six plus six) or verse of "arte mayor" (verse of eight lines each of 12 syllables). The themes of this poetry comes from, basically, the Provençal poetry of Occitanian troubadours: love and its variations. On the peninsula, they added a few characteristics, such as the allegories -characters based on abstract ideas-, the complex play on words, the lack of scenery and physical description, the lover´s acceptance of misfortune, etc. 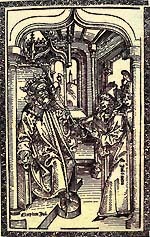 "Cancionero de Baena" a) the "Cancionero de Baena", recompiled towards the mid 15th century for King Juan II of Castilla. Amongst its poets we find names like Alfonso Álvarez de Villasandino, Francisco Imperial o Ferrán Sánchez de Calavera. 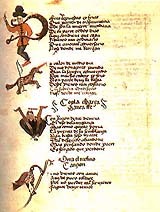 c) the "Cancionero General", recompiled by Hernando del Castillo in Valencia, in 1511, where we can read poetry from Fernán Pérez de Guzmán, Gómez and Jorge Manrique, Pero Guillén de Segovia, Florencia Pinar, perhaps the first Spanish poetess, Pedro de Cartagena and those mentioned above, Juan de Mena and Íñigo López de Mendoza. 3.a.- Íñigo López de Mendoza was, since 1445, Marquis of Santillana. He is specially remembered for his "serranillas" (verse of four lines each of six or eight syllables), which deal with the meeting between a knight and a peasant girl. He was the first author to write sonnets in Castilian, poems of Italian origin, not well known even in Castile. He developed allegories and doctrinal poems and established one of the biggest libraries of his time. King Juan II 3.b.- Juan de Mena was a friend of the Marquis. 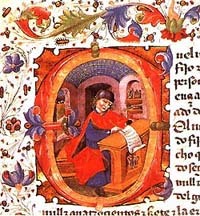 He travelled to Italy and became chronicler to King Juan II of Castille, to whom he dedicated his most famous work, Labyrinth of Fortune, an allegory of nearly 300 octaves of "arte mayor", which copies the [Divine] Comedy by Dante Alighieri and deals from the geography of the world to the difficult political position in which Castille found itself at that time. 3.c.- Jorge Manrique, nephew of Gómez Manrique, was son of Rodrigo Manrique, Master of Santiago. Among his poems, too similar to those of any author of his time, what stands out for their originality are the Verses of the Death of his Father. His ideas of death and the passing of time still hold extraordinary strength and validity today and were expounded on his own death. 4.- To complete the scene of poetry during this epoch, we can refer to various types of works: from the Dance of Death, to Dialogue Between Love and an Old Man, via satirical poetry, like theVerses of Mingo Revulgo or the Verses of the Baker Woman, etc.